Andy Warhol was kind of crazy. I think that’s what people liked (or didn’t like) about him. He was a bit cooky, hung out with lots of famous people, and made these hyper-modern paintings that used the popular culture that surrounded him. And, with all that nutty behavior and interesting art, Andy Warhol became an icon himself. Along with using repeated imagery, he tied in bright vibrant colors. Warhol often placed complimentary colors next to each other (complimentary colors are located opposite each other on the color wheel – red and green, blue and yellow, orange and purple) to really make things super dramatic. Along with others, such as Roy Lichtenstein, Warhol was part of the exciting Pop Art movement of the 1960’s. Well, yesterday afternoon, when the wee tot decided she wasn’t going to nap, and I needed to figure out a way to stay sane and get through the afternoon, I figured we may as well create a fun artwork with Warhol as influence. My daughter is just starting to figure out shapes and what they are all about. 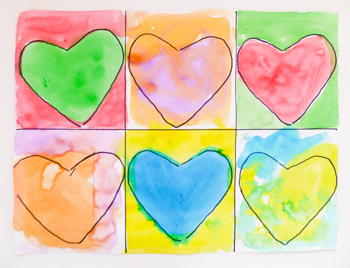 So, using her favorite shape – a heart – seemed like a fun way to make a repeating, colorful artwork in the style of Warhol! I shared with her some of my favorite Warhol paintings and enjoyed watching her point out all the different things she saw. First, I divided a 9 by 12-inch piece of white construction into a grid forming six equal sized squares. If you’ve got an older child, she can get out a ruler and pencil and do this for herself, honing her math skills. Now invite your child to draw the shape she selected in each of the squares, trying to make them all the exact same size. My daughter’s a bit young for drawing her own hearts, so I helped her out with this step by tracing around a heart cookie cutter (which your child could do, too!). Now get out the watercolor paints and encourage her to paint the inside of each shape a different color. Then, she can paint the outside of the shapes its complimentary color – or use whatever color combination she would like! My wee tot started out strong, but after two or three squares got distracted, so I helped finish her creation. Your child’s finished Warhol artwork can proudly be displayed in her room – or on her door welcoming others to come on in!